Unlikely, but that won't keep the naysayers away. We made it through the weekend without a shutdown, as Congress agreed on a plan to keep the government open. But a far more important showdown is set to take place over the coming weeks as Congress votes on whether to raise the federal debt ceiling. This is nothing new. The debt ceiling has been raised 10 times in the past 10 years. But raising it in the past has never been an issue. This time around looks to be more contentious as a new political dynamic brought by last fall's election promises to challenge the status quo. What happens if the debt ceiling isn't raised? The Treasury says it could use a series of short-term tricks to keep current until early July. After that, the United States would default on its debt for the first time in modern history. Scary. But let's change topics a bit. Say the debt ceiling is raised. That, of course, doesn't mean we're out of the woods. Public debt is careening out of control at a rate that's miles away from sustainable. Some have been wondering aloud how long it will be, even if the debt ceiling is raised, before the U.S. defaults. The national debts that finally drove Portugal to seek a bailout this week amounted, at the gross level, to 87% of gross domestic product, according to International Monetary Fund data. The same figure for the United States of America? Try 99%. The massive budget deficit that finally broke Portugal in the bond market: 8.6% of GDP. America's 2010 deficit? About 8.9%. So maybe the question isn't whether the next country in line is Italy or Spain. It's whether it's closer to home. But there's a missing point here. The history of sovereign defaults makes one point very clear: There's no magic "tipping point" that pushes countries into a danger zone of default. Great Britain survived World War II with debt totaling 240% of GDP. It avoided default. Russia, on the other hand, defaulted in 1998 with debt-to-GDP of just 12.5%. Albania defaulted in 1990 with debt to GDP of 16.6%. The United States exited the second world war with debt equal to well over 100% of GDP. It never defaulted. Japan has the highest debt-to-GDP ratio in the developed world (over 200%), yet can borrow an almost unlimited amount of money at interest rates that round to zero. Why the discrepancies? As former Citigroup Chairman Walter Wriston once said, "countries don't go bust." It's very, very rare that a country actually runs out of money and literally can't pay its debts. Taxes can be raised, or (more often) money can be printed. Instead, countries choose default because it becomes the least-bad option. Why raise taxes on citizens who vote when you can default on international investors who do not? Defaults usually aren't economic events. They're political ones. Here's the conclusion of all of this outlined in Carmen Reinhart and Ken Rogoff's book This Time is Different: The most reliable indicator of future default isn't debt-to-GDP. It's past default. The fact that the U.S. has a debt-to-GDP ratio higher than Portugal tells us nothing. Portugal has a history of default. The U.S. does not. The bond market will lose faith in Portugal long before the U.S. And it should. At equal rates of indebtedness, markets will be far kinder to Ford (NYSE: F) than they will General Motors (NYSE: GM) going forward. Why? Because Ford has shown a willingness to make sacrifices necessary to avoid default. GM has not. Same goes for countries. Something else to consider: The total amount of national debt isn't what's most important. It's the carrying cost -- the interest paid on the debt -- that really matters. Most countries have never, and will never, pay off their debt in full. It gets rolled over indefinitely. People can't get away with this because we eventually die. Countries keep chugging along. There's no inevitable day of reckoning when everything comes due. Interest payments are the primary concern. Here, there's good news. While debt has surged over the past decade, interest rates have plunged. 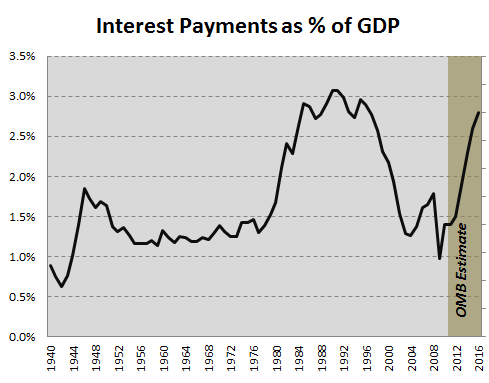 Net interest payments as a percentage of GDP are now actually about as low as they've been in the past half-century. Even the projected spike over the coming years doesn't create anything unprecedented. These projections could of course change in a heartbeat. But the situation probably isn't as dire as some make it out to be -- yet. If left unchecked, it's really in the forecasts of 2030 and beyond that the cost of our debt becomes an unimaginable burden. There's a long history of commentators fretting about an impending public debt implosion that never arrives. It's true that several countries, including the US and UK, have large structural fiscal deficits and huge unfunded contingent liabilities. But it's a mistake to extrapolate current fiscal deficits indefinitely into the future and point to "inevitable" bankruptcy. In time, welfare and pension obligations will be reduced and taxes will rise ... furthermore, large industrial economies, such as the US and UK, have in the past carried large public debt burdens without defaulting. They have deep financial markets and domestic banking systems that are capable of absorbing vast amounts of government debt. Most importantly, unlike Greece and other stricken Eurozone members, public debt is issued in their own currency and they maintain control over their central banks and foreign exchanges. Given these institutional characteristics, default is extremely unlikely. What say you? Sound off in the comments section below.